"To Dennis & Pauline. Thank you so much for the good work on my chesterfield, also the chair's a success and everyone loves them. All the best and a successful new year." "Hi Dennis. I wanted to let you know how happy I am with the work you recently did for me. The 2 chairs look like new now. I really appreciated you getting it done so quickly and efficiently. 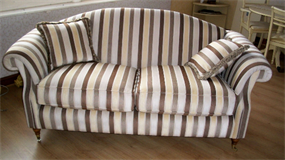 I will be back in touch very soon about the other chair I would like re upholstered." "Dear Dennis & Pauline. Thank you very much to you both." "Dear Dennis. Many thanks for the excellent job you have done in restoring our chaise lounge. I cannot quite believe the difference it has made and we were very impressed with how promptly you carried out the work."